Among activities in response to Earth Hour Campaign 2019, “Green Challenge” program has been implemented by Sai Gon Giai Phong Newspaper in coordination with HCMC Urban Environment Company on March 23 and 24. 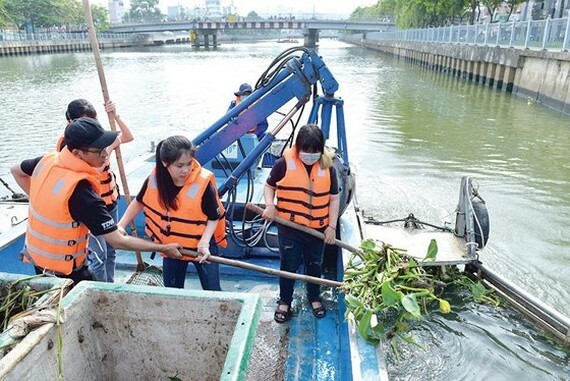 The program has attracted over 500 activists who have registered to remove garbage from Nhieu Loc-Thi Nghe canal and Thu Duc wholesale market, aiming to raise the community’s awareness of protecting the environment and the depleting source of clean water. For the last many years, the organization board of the Earth Hour Campaign has worked with HCMC Urban Environment Company and the people’s committees in District 1, Phu Nhuan, Tan Binh and Binh Thanh to implement many activities propagandizing residents against canal littering. Still the issue has still been popular. Director of the company Mr. Huynh Minh Nhut said that workers of the company collects 10 tons of garbage from canals a day on average which increase by 10-15 percent annually because part of residents living alongside canals and vendors have kept the habit of littering. Worse industrial waste and interior furniture have been thrown into canals. Mr. Nguyen Van Hoa, permanent deputy chairman of Vietnam Urban Environment and Industrial Zone Association, said that Vietnam is facing garbage treatment challenge. Currently, garbage discharge in the country approximates 12.8 million tons a year and the number is forecast to increase 12 percent a year. The volume of garbage collected is about 85.5 percent in urban areas and 45.5 percent in rural areas, the remaining amount is directly dumped into the environment. In addition, the treatment method of collected garbage is very outdated with most having been buried. That has caused environmental pollution in garbage collection spots and landfill sites. According to Mr. Hoa, the country now has 660 landfill sites having the area of one hectare each but only 25 percent of them meet hygienic standards. Nhieu Loc-Thi Nghe in HCMC and the system of canals in the country have been heavily polluted with untreated wastewater from production, health and household activities. 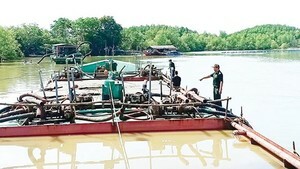 A survey conducted by HCMC Department of Natural Resources and Environment shows that last year the surface water in most canals was tainted due to both treated and untreated wastewater from industrial parks, export processing zones, health clinics and especailly 13 industrial zones in Districts 7, 8, 12, Binh Tan, Thu Duc, Binh Chanh, Hoc Mon and Cu Chi. Moreover, the city’s canal system has to receive over 1.75 million cubic meters of household wastewater a day. Mr. Truong Khac Hoanh, director general of Tan Hiep Water Investment Company, said that water source from the Saigon River and the Dong Nai River, supplying water for over 20 million people living in the southern region, has been increasingly polluted partly because of wastewater from industrial and export processing zones and businesses operating along the rivers. The water source contains a large amount of domestic waste especially plastic items making it hard for treatment. The Ministry of Natural Resources and Environment said that 80 percent of surface water in canals, rivers and lakes has seen quality degradation countrywide. For the last past, the ministry has worked with authorized agencies to assist residents to access clean water but their efforts have covered 80 percent of people. The remaining ones have continued using water with quality decrease or even polluted with toxic substances such as arsenic. Water source in most urban areas, industrial zones and trade villages has been contaminated.